342 14th St. in Park Slope will be renovated and rented as affordable housing under the city’s “third party transfer program. PARK SLOPE — A boarded-up building on 14th Street will be renovated and turned into affordable rental units, officials said. 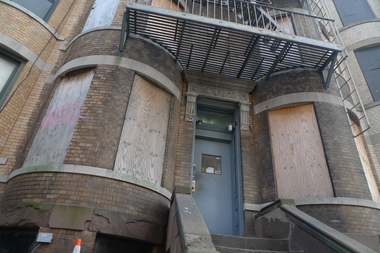 The eight-unit building at 342 14th St., between Sixth and Seventh avenues, will be rehabbed and then rented to moderate income tenants, said Salvatore D’Avola, executive director of Neighborhood Restore Housing Development Fund Corporation. The nonprofit group is overseeing the project under the city’s third-party transfer program, which turns foreclosed properties over to nonprofit developers who convert them into affordable housing. Neighborhood Restore administers the program for the city’s Department of Housing Preservation and Development. The nonprofit developer Bridge Street Development Corporation will eventually own and manage the building. The run-down building is now vacant but two tenants lived there when Neighborhood Restore took control of the property in 2012, a spokeswoman for HPD said. They’ve since been moved out but will be allowed to return and pay their previous rents when the project is complete. The other six units, all one-bedroom apartments, will be rented to “moderate income families,” but the exact income limits haven’t been set yet, an HPD spokeswoman said. Officials hope to start construction by the end of the year, D’Avola said. The affordable housing plan comes as Park Slope real estate prices continue to soar. The neighborhood just set a local record with the sale of a $12.4 million mansion at 17 Prospect Park West. The 14th Street affordable housing development is across the street from a day care for low-income children that will soon be torn down and replaced with market-rate condos. The 14th Street building is one of nine foreclosed buildings in Brooklyn that will soon be rehabilitated and converted into affordable housing under the third-party transfer program. The others are at 248 and 250 Madison St. and 969 Putnam Ave. in Bedford-Stuyvesant, and at 941 Park Place and 915, 971 and 973 St. Marks Ave. in Crown Heights.